Saint Luke, the author of the two biblical books – The Gospel According to Saint Luke, and Acts of the Apostles – claimed to have witnessed the events of Yahwehyeshua (Jesus). In the light of Luke’s assertion, it is pertinent to note that the Bible was written by historians who witnessed or gathered information about what truly transpired. Of course, every written material is inspired by a spirit – good or bad. Good books are inspired by the holy (good) spirit, while bad ones – materials aimed at destroying people – are inspired by an evil (bad) spirit. As believed by scholars around the globe, but for The Gospel According to Matthew, no other book of The New Testament was actually written by the disciples. Instead, the communities they instituted wrote the books and titled them after the disciples as a commemoration. Those days, information was passed orally and only important documents were in written texts. The fact that The New Testament was written 200-400 years after the resurrection of the Son of Man planted doubt in people’s mind as regards the authenticity of biblical stories. This generation, not willing to repeat such mistake, has begun to pen down events as they happen around Mazi Nnamdi Kanu for the unborn. When the powers that be sought to cut short his life and abort his mission on earth, the charismatic leader of Biafra miraculously escaped. He remained incommunicado for thirteen good months after which he made a public appearance in the holy land of Israel. The possibility of his escape and journey to the land of Israel unseen and without passport (as both his British and Nigerian passports were seized by Nigerian government) stirred a mysterious air around him, even leading some to accuse him of diabolism … reminiscence of Jesus being called demon possessed. It is worthy of note that after his historic reappearance on that fateful day, 19th October 2018, at the Wailing Wall of the City of David, Jerusalem, a crucial sign occurred in Israel twelve days later, bearing witness to his Messianic mission. On Wednesday the 31st of October, 2018, as reported by Times of Israel and other news outlets around the globe, a coin-marked snake appeared in the Western Wall of Jerusalem attempting to devour a dove. It failed, however. That incident was of such significance that Jewish rabbis interpreted it as a sign of the coming of a Messiah and of freedom. That this event took place exactly on the twelfth day of Kanu’s appearance at the Wailing Wall is of another great significance. Analysis from different quarters interpreted it as signaling the completion of the twelve tribes of Israel. Biafra being a lost tribe of Israel has been gifted a Messiah who will triumph over all forces to set free her. In Jewish eschatology, the term Mashiach or “Messiah” refers to a future Jewish king from the Davidic line that is expected to be anointed with holy oil. Israel’s traditional views hold that the Messiah will be descended through the line of King David, and will gather the Jews back into the Land of Israel, usher in an era of peace, and build the Third Temple. 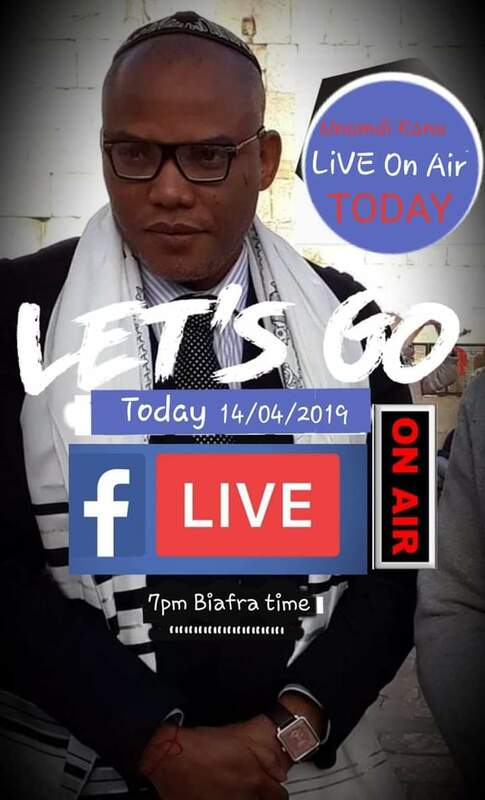 Mazi Nnamdi Kanu in his radio broadcasts has been hammering on building a magnificent temple for Chukwu Abiama (Hashem) in Biafra. The third temple spoken of in the Bible, no doubt, is to be built in Biafra – a bloodline of Israel. Just as John the Baptist was seen as the reincarnation of Prophet Elijah (Matthew 11:13-14), Mazi Nnamdi Kanu is today regarded as the reincarnation of Moses. The feat of dividing the Red Sea is till today a mystery no one in history has replicated. In Nnamdi Kanu’s case, a similar mystery has been observed: the sun follows him wherever he goes, bearing witness to his divine mission on earth. Critics have resorted to defamation, spinning the yarn that the Biafran leader uses diabolic means to draw the sun. The question, however, is: how come no magician or shaman in history has achieved that feat? Moses, an Israelite by birth, was also an Egyptian citizen. Comparatively, Mazi Nnamdi Kanu, a Biafran by birth, is also a British citizen. While Moses grew up in Egypt, Mazi Nnamdi Kanu, although born and bred in Biafra, has lived most of his life in Britain. As Egypt were an enemy and oppressor of Israel, so also is Britain an enemy and oppressor of Biafra (although currently orchestrating their oppression through the Nigerian entity). Furthermore, Moses was a prince, Nnamdi Kanu is a prince. Moses was envied and antagonized by Korah, Dathan, and Abiram. Nnamdi Kanu is envied and antagonized by Nnia Nwodo (president of the proscribed Igbo socio-cultural group, Ohaneze Ndigbo), Okezie Ikpeazu, Dave Umahi, and the likes. Moses was accused of exalting himself above the assembly of the Lord. Nigerian clergy, spun by envy and shear vile, accuse Kanu of exalting himself above Jesus. We shall not forget that even Jesus himself was accused by the then clergy of equating himself with God. Well, the emergence of Mazi Nnamdi Kanu, it now looks obvious, is a fulfillment of yet another of Nostradamus’s prophesies. Long live Mazi Nnamdi Kanu, God-sent liberator of the black race. Elucidating, I explained that the APC cabal are set to rig their way back to the presidential villa, and will not relinquish power except something monumental is unleashed on them. 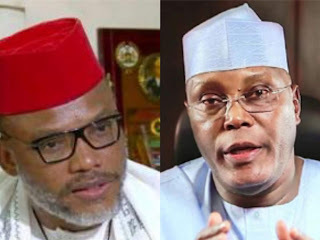 To claim power from them, therefore, Atiku would have to threaten them with telling Nigerians that Kanu is right about Jubril, relaying every piece of information he has on the impersonation plot, and then, putting the final nail in the coffin by demanding the impostor’s DNA test. Returning blow for blow, the enigmatic leader of Indigenous people of Biafra, Mazi Nnamdi Kanu, shocked the world with Atiku’s place of birth, date of birth, and the very process that made him a Nigerian citizen, juxtaposing these revelations with the constitutional provisions on one becoming the president of Nigeria. Born in 1946 in Jada, a town belonging to Northern Cameron, Atiku became a Nigerian through a plebiscite held in 1961. But the Nigeria constitution clearly states that to qualify to run for the office of the president, one must be a Nigerian by birth. The point here is not being a citizen or not as most people mistakenly argue, the point is being born a citizen or not. Atiku and his people became citizens after the plebiscite of 1961, no doubt. But Atiku was born before that plebiscite, meaning he was not born a Nigerian, and Nigerian constitution clearly spelt one must be born a Nigerian to qualify for its most coveted political seat. It is rather lugubrious that many a legal practicing folk are still in the dark as regards this matter, but then, education in Nigeria is a scam. The difference between Atiku and his kids should be noted, however, for while his children are born Nigerians, Atiku is not. It should be noted that had PDP not attacked IPOB, Kanu wouldn’t have dug out Atiku’s background in relation to the constitutional provisions, and if he hadn’t dug that out, the APC would have been sparing in their rigging, and if they had been sparing in their rigging, Atiku certainly would have emerged winner. And if in their desperation, APC had still gone on with massive rigging, Atiku, with all the shreds of evidence at his disposal, would have reclaimed victory at the tribunal as the APC wouldn’t have been in possession of such lethal arsenal now being employed to stop him. But the Igbo politicians in PDP did the damage. It was them that, cuing behind Peter Obi and fearing that Kanu’s call for boycott would greatly undermine their chances, launched diatribes at the IPOB leader – one mistake too many, for that single action midwifed the firing of the ferret that sunk Atiku totally. It is very sad and gravely disappointing that Nigerian Police Force in Delta State, that epitome of corruption and evil, have taken time off from their usual extortion on check-points and daily killings of innocent civilians to once again turn their murderous attention to IPOB. Their well-publicized lies about alleged police station invasion by IPOB in Asaba yesterday is so ludicrous that only a natural born liar like Lai Mohammed and possibly a rabid anti-Biafra deranged fool can believe such hogwash. Perhaps the Inspector General of Police and some Fulani elements within the Nigerian Police Force is seeking to relieve the pressure Jubril Al-Sudan the Buhari impostor is undergoing at the election tribunal in Abuja, where we understand he has been compelled to tender what we all know to be a non-existent WAEC result. Whoever concocted this silly allegation about IPOB invading a police station and sold it to the Nigerian press must be steeped in the same lying tradition as Lai Mohammed. 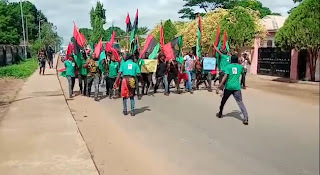 The truth of the matter is that Delta State IPOB family members were attacked on Tuesday, April 16, 2019 during a peaceful procession in Asaba the capital of Delta State. For those who may wish to know, Asaba is a Biafran town and the birthplace of Col. Achuzie, one of the great heroes of the Biafra-Nigeria war. Therefore, we IPOB have every right to exercise our constitutionally guaranteed right to peaceful assembly. At no time did we IPOB or anybody for that matter invade any police station in Asaba. All the lies the Delta State Police Command concocted is purely to justify the killing of innocent people during the procession. We are disappointed that in this day and age some media houses will elect to abandon objectivity when reporting a statement from a world-renowned institutionally corrupt police organization. Just like other solid nations of the world, what makes them solid and cohesive is their single ideology and a uniform value system. In that sense, they adopt the same style of politics, obey the same law as contained in their nation's constitution and above all, uphold the federal character. 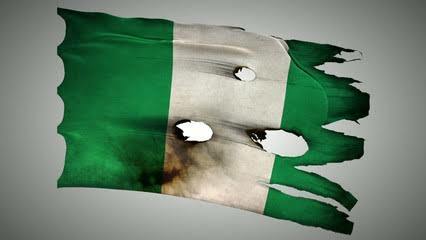 But sad enough, all these aforementioned attributes of a solid nation is roundly deficit in the Nigerian system. 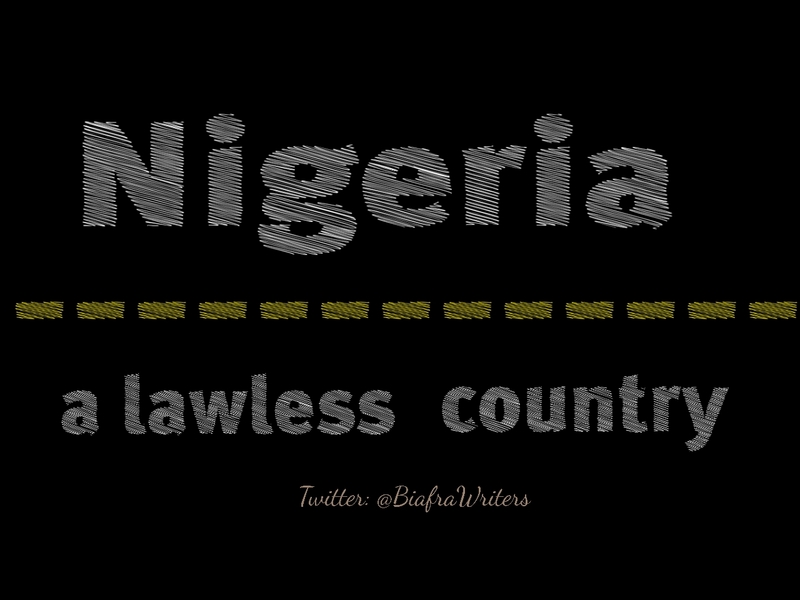 There's no level playing ground for all and sundry, the Southern and Northern states of Nigeria operate two distinct laws – the common law and Sharia law respectively, including separate ideologies. It is so sad that 59 years after independence, and 52 years since after the Biafra war, Nigeria as a single entity is yet to find a lasting solution to its protracted ethnoreligious problems and has failed to uphold the federal character principle which should be the basis of the ONE NIGERIA mantra as been sung as jingle by those at corridors of power who invariably were responsible for the divisions and ethnic clashes in the country through their actions and inactions. 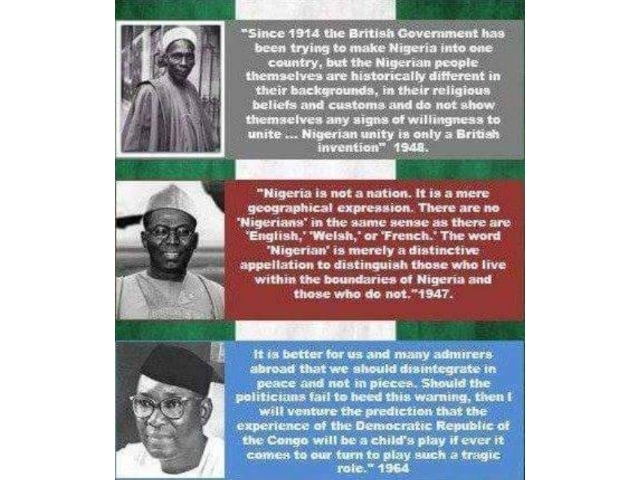 The phrase, 'One Nigeria' came into existence during and after the war when the now South East region decided to secede and build their own separate nation since the rest of the federation has rejected them as being part of the federation, but instead of letting them go their separate ways, they invented the 'One Nigeria' mantra in order to continue to hold them perpetually captive against their wish. 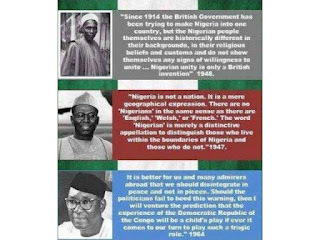 Sincerely, looking at the above scenarios, one will find reason to agree that the mantra called 'One Nigeria' is a hoax; a deceptive illusion of robbing one section of the country to paying another section. 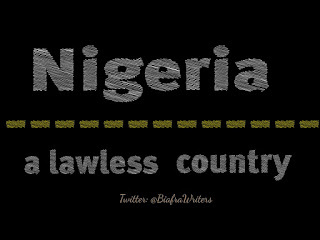 Therefore, there is no such thing as ‘One’ in the geographical expression we know today as Nigeria and this protracted ethnoreligious crisis will continue until it snowballs into another fatal civil war which will spell doom for the Sub-saharan Africa and it's environs unless the critical players and stakeholders comes to a round table to discuss how to peacefully dissolve the entity to allow any constituent decide either to go their separate ways or remain with them. 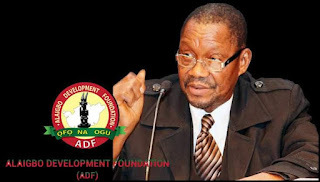 ENUGU - PRESIDENT of a prominent pan-Igbo group, Alaigbo Development Foundation (ADF), Prof. Uzodinma Nwala has stated that he felt disappointed with the current state of affairs in the Nigerian state, especially as it concerns the place of the Igbos in the present configuration, lamenting that unless the people came together to take their destiny in their hands, the future looked very bleak.